The World Commons Week, that ran from 4 to 12 October, marked the fiftieth anniversary of ‘Tragedy of the Commons’, an infamous Science article written by Garrett Hardin. Hardin was a biologist concerned with the impact of population growth on global natural resources, which he referred to as ‘the commons’. He viewed these commons as a free-for-all, anarchic body, and concluded that they are destined towards dismay (and by way of solution, he advocated population control). And how could he not think so? Just look at the climate, you might say. Over the past 50 years however, many scholars have been very busy disproving Hardin’s pessimistic assessment of commons. Traditionally, a ‘common’ was a field where cattle grazed or crops were grown by members of a certain community. The use of the common was strongly moderated by rule and tradition. Many examples of historical commons are well studied and show high levels of institutional sophistication (see, for example, the extensive work of Elinor Ostrom, and this website). Therefore we can rightly say that commons can be celebrated as harbingers of sustainability rather than sites of tragedy and deterioration. We do live in an age of accelerating pressure on the environment. One temperature or precipitation record is being broken after the other; again this year, Europe lived through a blistering hot and bone dry summer. It has become clear that this age of change requires not only new technology, but new political ways to mediate relations between people and the rest of the natural world. Politics of Nature was the first initiative to be invited to the Chamber of Commons. 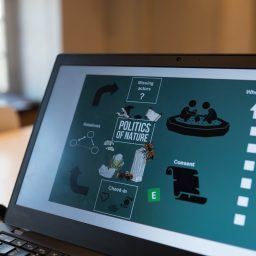 Politics of Nature is an international initiative uniting people from tech, sciences and society to rethink, develop and deploy better ways of governing the commons. The project will explore how humans can learn to interact with non-humans and engage in a joint political discussion where the end goal is to achieve ‘consents for coexistence’. By drawing out these statements, we learn to readapt our ways of living to the social-natural commons we are all part of. The Politics of Nature initiative takes its name from the eponymous book by Bruno Latour, portraying a social order in which humans and non-humans are interacting in the same social and political sphere. This order is referred to as the Parliament of Things and first described in Latour’s essay “We have never been modern”. Politics of Nature builds on top of Actor-Network Theory, a theory in which reality is constantly constructed and deconstructed in relationships, and popularized in Callon’s paper on the interdependencies of fishermen, researchers and scallops. The meeting game (described later) was inspired by the Cratic Platform, merging components from Sociocracy and Holocracy. Added to the box of methods are Life Cycle Assessment to bring understanding of the environmental effects of products and services, and the concept of Privacy by Design, by which privacy and security can be built into the meeting format – essential for the proper functioning of democracies. With these components, the Politics of Nature initiative creates frameworks and toolboxes allowing multiple perspectives to coexist. 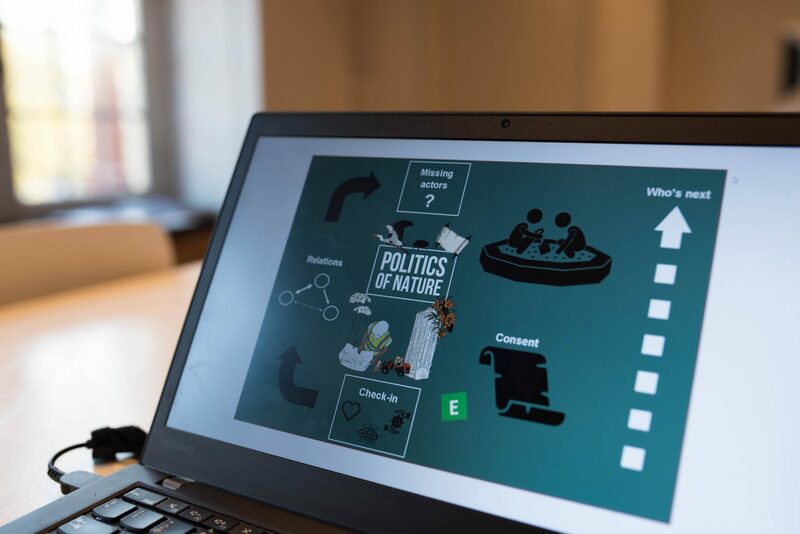 The Politics of Nature meeting game is the first tool developed, intended to quickly identify the relevant actors along with their needs, worries and wishes. These are to be visualized in analog and virtual environments, and from here, distill proposals allowing the continued existence of the actors involved. In the Politics of Nature meeting game the participants become spokespersons for all kinds of things. The role of the spokesperson is something that many are already doing on a daily or monthly basis. If we are appointed that role, we are often better prepared and might even have chosen to represent a given interest. To be gently forced to include and represent new perspectives serves an educational purpose. This can help prevent polarization and increase empathy, which is an educational goal of the Politics of Nature meeting game. The long term vision is that, by making everything freely available, people can pick up the tools, and become empowered to explore their own context, map their own networks and hopefully identify durable and lasting solutions to apparently wicked and unsolvable problems. Joining hands with the Chamber of Commons, Politics of Nature embarked on the case of making Amsterdam ‘rainproof’. As the city has become more densely built and populated, the downpours associated with the changing climate pose real and urgent challenges to all inhabitants. Cellars may flood, moving around may be hampered, sewers may overflow – and these are just the more immediate risks. The meeting was kicked-of by three speeches. Socrates Schouten introduced the Chamber of Commons, and why it is more important than ever that we find ways to govern shared our resources so that every collective can survive and hopefully thrive. Then, Jakob Raffn presented the framework and background for Politics of Nature, followed by Anna Goede who laid out the Amsterdam Rainproof challenge to be addressed during the meeting. Prior to the meeting, Amsterdam Rainproof had carried out a comprehensive stakeholder analysis. Thirty actors from the stakeholder analysis, such as ‘rooftops’ and ‘the municipality’, were selected and their names written on cards, and randomly divided into a deck for each table. 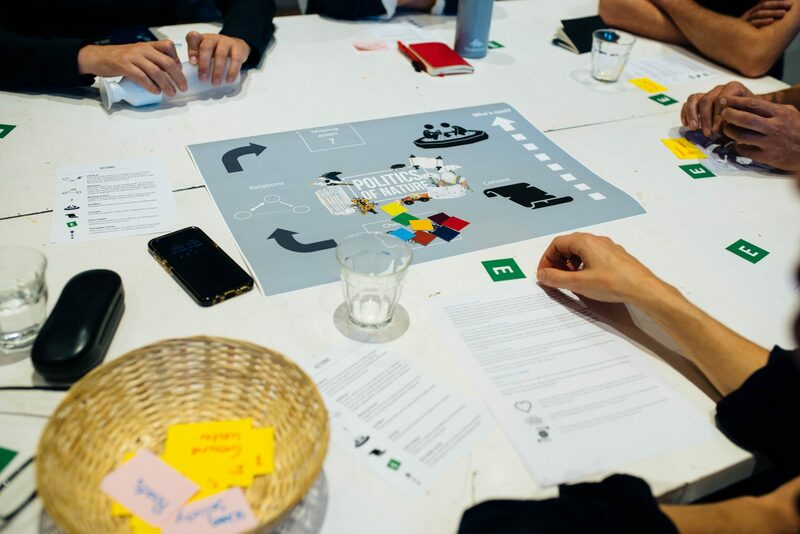 The participants were assigned colors to emulate the notion of privacy by design that will be more elaborately implemented in the digital game. The use of colors can of course not bring about anonymity between participants in a physical meeting, but it assures anonymity externally, with statements linkable to the color and not to a real name. The first step was for each participant to introduce themselves, their color and then draw actors from the pool that they would be representing as spokespersons. The process of the meeting game occured in two stages. 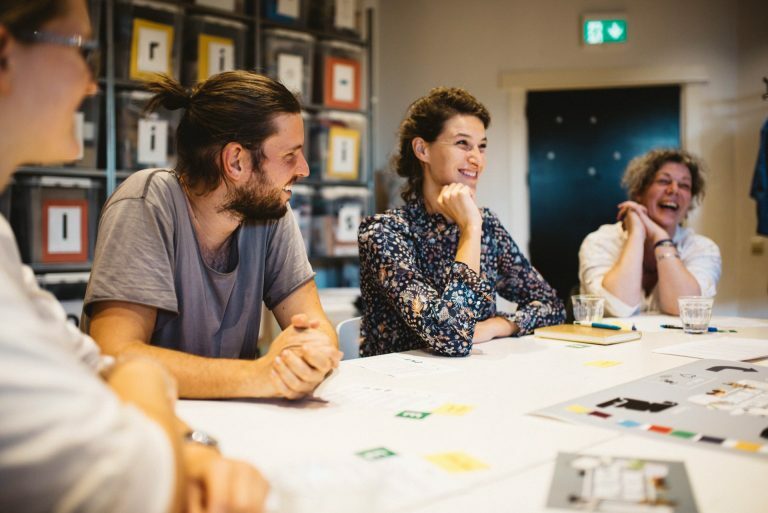 In the first stage the participants got acquainted with the actors – such as the sewerage system, roof gardens, or crayfish – and started exploring and understanding the bonds that tie them together. A green rooftop may help prevent ground level plans from being waterlogged, or planners may learn from the movement of perches. 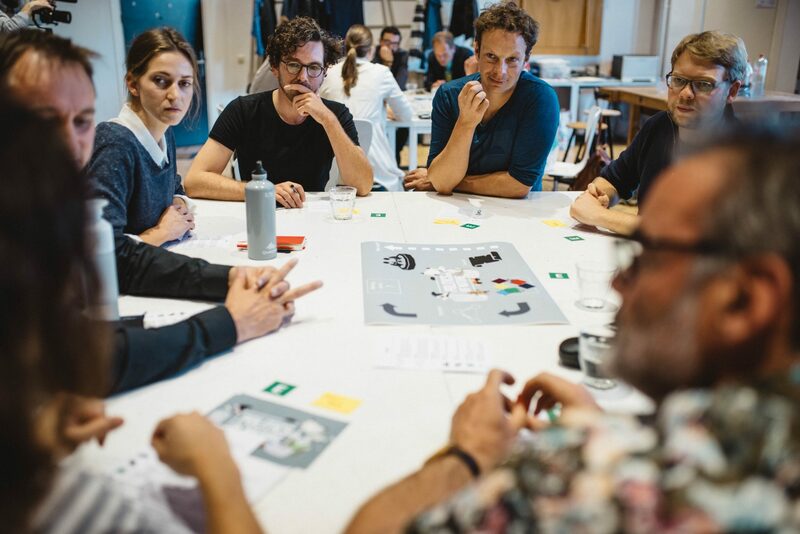 In the second stage, the insights gained from exploring the relationships and building the actor-network formed the basis of a discussion leading to proposals for possible ways for managing the commons. At the onset, the participants were slightly confused, but equally intrigued about how the meeting would unfold. Fifteen minutes in, the game started flowing. When Orange explored the relationship between roof top gardens and the other actors, the trees added that the city would be nicer with more fellow trees around. The birds chirped in and said that it would provide them with territory, migratory paths, food and nesting areas. The vegetable growers would like to get involved to create local produce with the inhabitants. The municipality was looking forward to spending the European grant allocated to green and blue roofs in Amsterdam. The Research Institute saw a new research project coming up exploring the effects of rooftop gardens. The surface water responded that it would receive less water, and finally the unemployed people were curious about the possibility to be re-skilled and work with rooftop gardens. After the break, when the players moved into the sandbox, this idea was explored further and made into a proposal by a hypothetical citizen initiative: “Create a climate adaptive garden on the basis of a circular local system”. The proposal obtained full consent, meaning that building such systems could not be identified as harmful in economic, biophysical or social terms to any of the 40 actors identified and represented. Overall, only general and non-pervasive interventions obtained full consent and it remains to be seen if above proposal would enjoy similar support if it was revealed, for example, that the costs would be two thousand euros per household. No Politics of Nature-editions are alike, and no tables are alike – that was also the case at Waag. Some players find comfort in rules and control, while other players thrive in a more free environment. The same applies to society. The flexibility of the game proves to be important in supporting these differences. One needs to know the actors and relations are affected by a given theme before solutions can be proposed. How deep the game will go is defined by the available time and the desire of the players. The game also allows for distinguishing knowledge levels and create a greater room for nuances. For example, one can agree on a proposal on an ethical level, but at the same time deny the proposal out of economic interest. After an hour, the players started to get the hang of it. Actors that were missing and important to include were co-mapped, and people started to understand that they have ‘relations’ and shared interests with actors they weren’t aware of. But some players thought that the group was going into too much depth with the roles and perspectives, and were not moving forward with proposals and the overall topic. While indeed the game seems to advance slowly in conventional terms, glossing over the intricacies holds the danger of addressing ‘things as usual’. And that is precisely what we wish to challenge. How can I think like a fish? And why is it important? The role of the spokesperson is something that many are already doing on a daily or monthly basis. If we are appointed that role, we are often better prepared and might even have chosen to represent a given interest. To be gently forced to include and represent new perspectives serves an educational purpose. This can help prevent polarization and increase empathy. As outlined in Latour’s writings, Politics of Nature is intended to be an ongoing learning process. To accommodate this, the upcoming editions of Politics of Nature will strive to conduct a series of linked workshops instead of a single one. Furthermore, it will investigate the tension between subjectivity and objectivity. Individually, the accounts of spokespersons are subjective, but a degree of objectivity can be obtained by increasing the number of representations of a given actor or controversy. To multiply the number of concurrent representations, beyond what is possible in analogue meetings, the use of digital technology will be explored. For instance, the use of ‘liquid democracy’ could allow a dynamic and nuanced delegation of votes where people can consent to representations provided by spokespersons. Whenever an actor, human or non-human is unable or unwilling to participate, spokespersons will step in their place and the validity of the representation be subjected to democratic justification. In our quest to identify a roadmap towards a sustainable society for humans and non-humans alike, we are facing the challenge of balancing transparency against privacy and accountability against liberty. It is important to state that we have not found the right solution yet. Therefore, we invite anyone with an interest or expertise within encryption, security, privacy or a skill we weren’t even aware was missing to reach out and contribute. Politics of Nature can be reached per email, Waag and the Chamber of Commons can be contacted via the contact page.